Spring has arrived, and along with it, home improvement time! Nature has refreshed itself with bright leaves and blooms, and many of us find ourselves wanting to refresh our homes as well. The most dramatic change you can make to your home, for the least amount of money, is with paint, and it’s also a project that many homeowners can tackle themselves. That said, choosing paint can be a daunting task for some, and one of the questions I’m frequently asked is, “Which sheen should I use, and for which areas?”. Flat ~ Commonly used on walls and ceilings, this paint has no sheen. Though it is washable, scuffs and smudges don’t remove as easily as they do from paints with sheen, and you might even take some of the paint along with the smudges. I rarely recommend flat paint for walls. Gloss and Semi-Gloss ~ This is a matter of personal preference, but either of these two sheens are typically used on trim (baseboards, doors, crown molding, etc. ), though semi-gloss is the most commonly used. These paints are highly washable, and very easy to maintain. Pearl, Eggshell, etc. 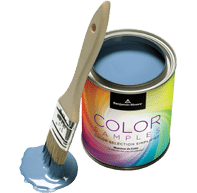 ~ These paints have a lower sheen than gloss and semi-gloss, and each paint company has different names for them, as well as several levels of sheen which vary only slightly from one to another. Because any paint with sheen is more washable, I always recommend a low-sheen paint on walls. Not only does it make them easier to keep clean, but they produce a “richer” appearance and have a better saturation of color. Some painters are even recommending low-sheen paints for the exterior of homes too! Though dust and cobwebs remove more easily, be careful about using a sheen on the body of your house. It can be tricky, depending on the color you choose. Next week’s blog will talk about Alkyd vs. Laytex. I’ll tell you the difference between oil-based and water-based paints, and where to use them. Remember, great design doesn’t have to be expensive; it’s how you put it together!